The Polish Armed Forces Memorial pays tribute to the Polish Forces who gave their lives in the 2nd World War 1939-1945. It is located at the National Memorial Arboretum, Staffordshire, England and was unveiled on 19 September 2009. 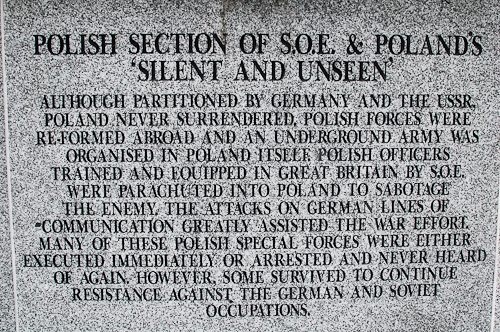 Silent and Unseen - A plaque on the memorial describes how Polish officers were parachuted into Poland to sabotage the enemy.